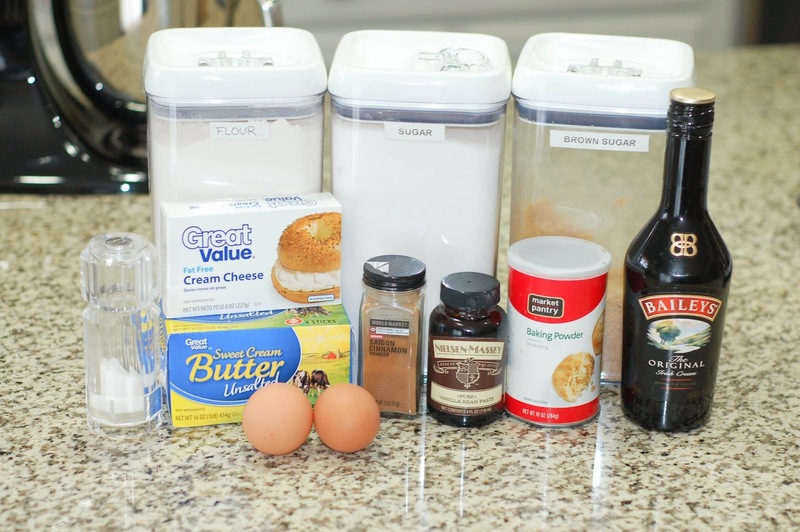 The original recipe for the cupcakes used cake flour, but I wanted to use all purpose flour. Perhaps that is why the first batch came out so thick. After a little adjusting, I was able to make it work with all purpose flour. I only filled my cupcake liners half way up. I didn't want a dome on the cupcakes. I wanted them more flat. I ended up with 16 cupcakes. On hindsight, I may have added more batter to each liner and only made 12-14 cupcakes. But these worked out just fine. I added extra Baileys to this batch and the taste was fabulous. I wanted to try a white chocolate ganache for the filling. I don't know if it was the white chocolate or the extra Jameson that I added, but this took forever to firm up. I had put the ganache in the fridge for about a half hour and although it was thicker, it was still pourable. I used the small end of a melon baller to scoop out the cupcakes and poured the filling in with a measuring spoon. Then I realized I had a lot of ganache left, so I went back and brushed the tops of all the cupcakes with more. I put the filled cupcakes back in the fridge for the filling to firm up more. 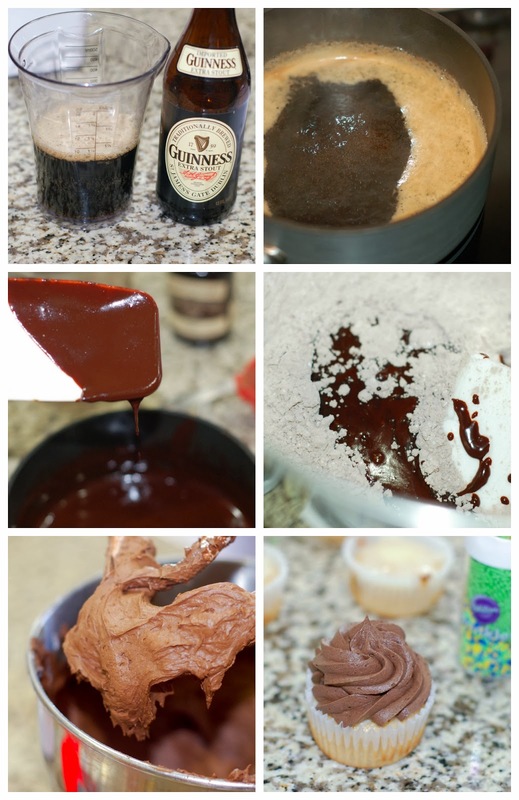 For the frosting I just tweaked the Dark Chocolate Guinness Frosting I made last year. I wanted a slightly lighter flavor. I didn't want it to overpower the cupcakes and filling. Beware, this frosting will taste so good you'll want to eat it by the spoonful. Try to restrain yourself and keep it to frost the cupcakes. Trust me, all together these make a heck of a combo. 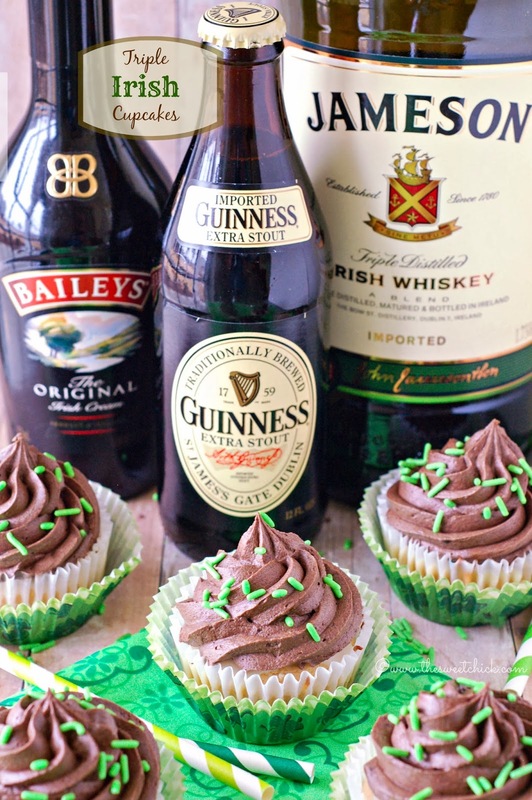 Baileys Irish Cream, Jameson Irish Whiskey, and Guinness Extra Stout beer, all the making of an Irish Car Bomb in a cupcake form. Now I never drank an Irish Car Bomb. 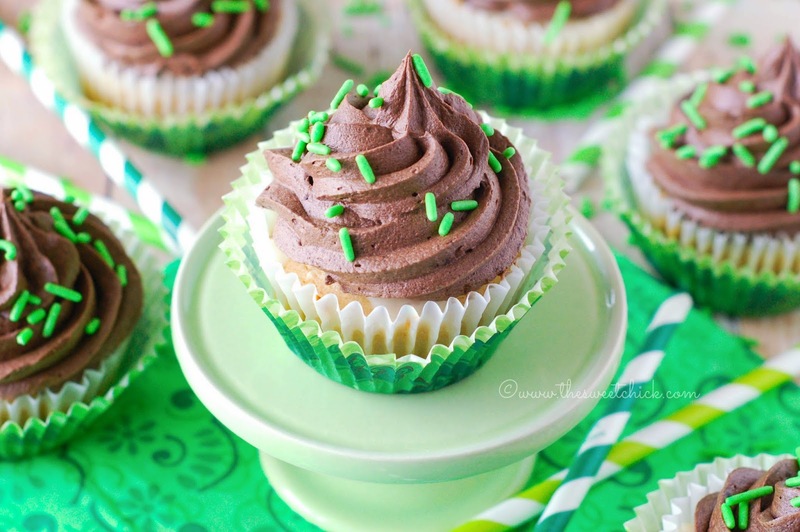 Supposedly they are mighty good, but my Triple Irish Cupcakes are even better. The end result in my adventures was a moist, super flavorful Baileys cupcake. A creamy, white chocolate whiskey filling, and a rich, dark chocolate Guinness frosting. The leprechauns are jumping for joy. Rainbows are bursting up everywhere. 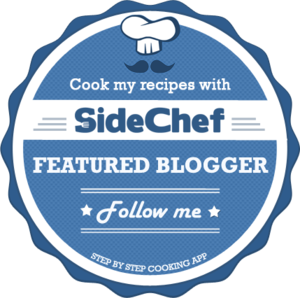 This recipe is golden. It's so creamy and dreamy. I don't care that the ganache didn't harden. 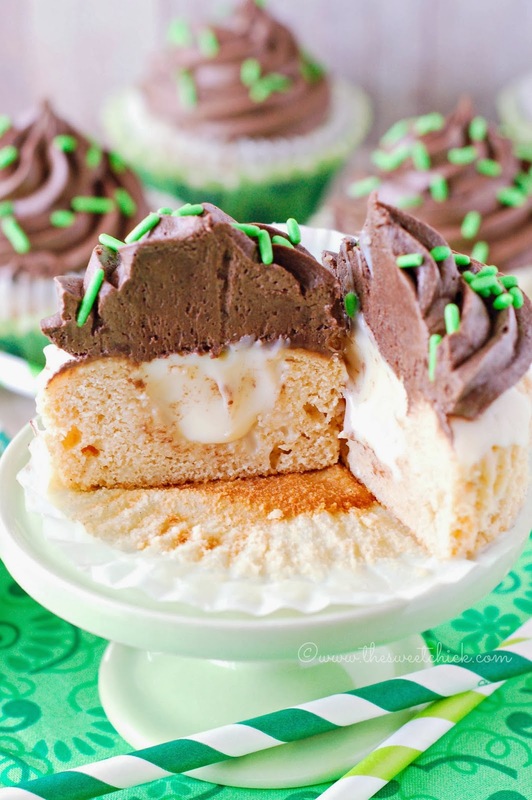 I love the creamy center of this Triple Irish Cupcake. It blends right into all the other flavors. 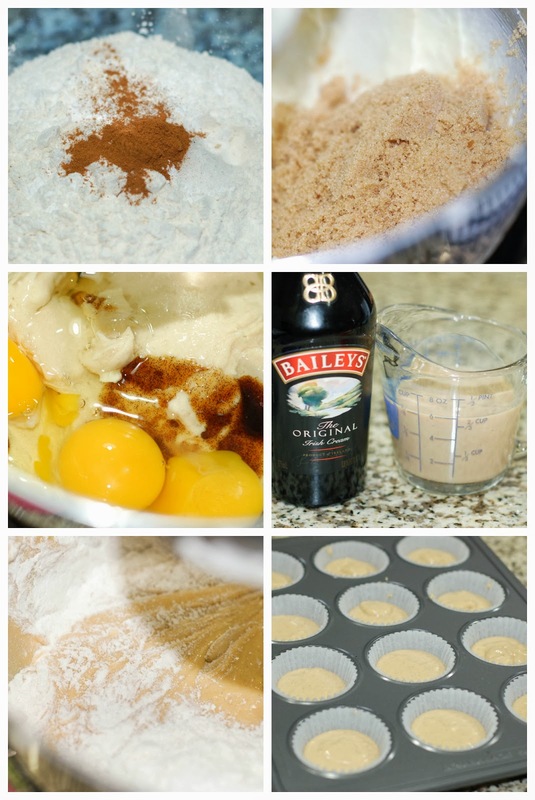 I am happy I added the cinnamon to the cupcake, it really brings out the Baileys flavor. And the frosting was just the right amount of sweetness and chocolate. The ratio of frosting to cupcake was perfect. I am glad I didn't make the cupcakes any bigger. These were worth a week of work. I am going to go eat another one right now. In a medium bowl combine the flour, baking powder, salt and cinnamon, blend well. In a stand mixer, cream together the cream cheese and butter. Add the sugars and vanilla. Mix until smooth. Then add the eggs and Baileys, continuing to mix until well incorporated. Slowly add the flour mixture to the stand mixer, making sure to scrape down the sides as needed. Mix until well blended. 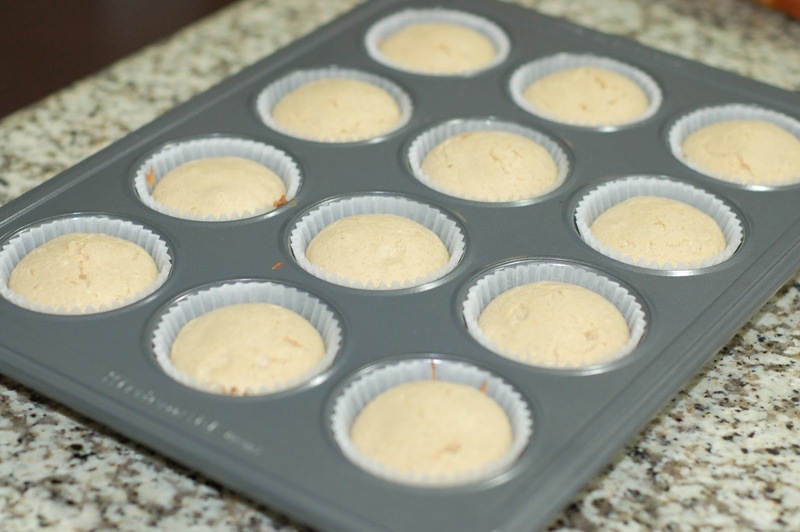 Place 16 cupcake liners into muffin pans and equally divide batter into each cupcake liner, about 1/2 way full. Bake cupcakes for 15 minutes or until toothpick inserted in the center comes out clean. Remove from oven and cool completely. Place cream in a small saucepan and bring to a simmer over low heat. Stir in the chocolate until melted, then add the butter. Stir until well blended. Remove from the stove top and add the whiskey. Whisk mixture until smooth. Allow mixture to cool to room temperature, then place in fridge for 1/2 hour to cool more. Mixture will thicken as it cools. While mixture is cooling scoop out the centers of the cupcakes and discard (or eat). I use the small end of melon ball scooper. Once mixture is ready, fill each cupcake with the chocolate filling. Then brush the remaining filling over the tops of each cupcake. Place cupcakes back into the fridge. Place beer in a small saucepan and bring to a boil over medium heat. Boil for 15 minutes, until beer is reduced to about a 1/4 cup of liquid. Remove from heat and add the Ghirardelli baking chips. Stir until all the chocolate is melted. Then put it aside to cool off a little and thicken. 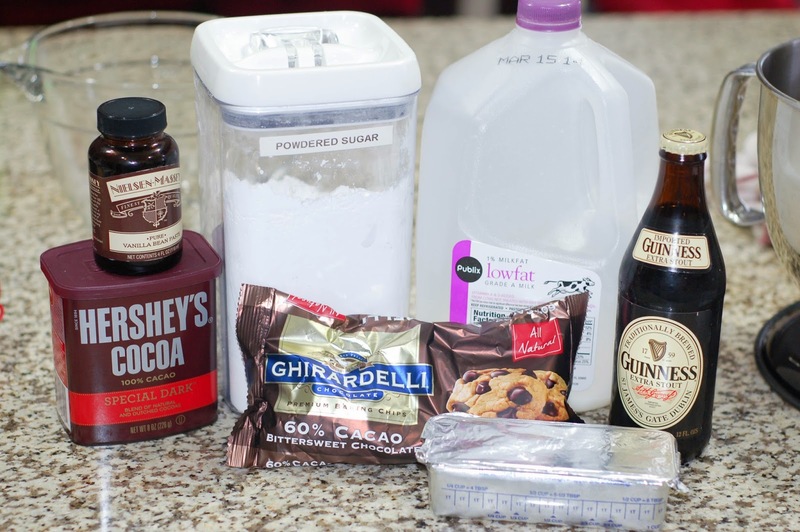 In a stand mixer, place the powdered sugar and cocoa. Mix on low until well blended. Then add the shortening, vanilla, and beer/chocolate mixture. Mix on medium speed until frosting starts to come together. Add milk 1 tablespoon at a time until frosting becomes light and fluffy. 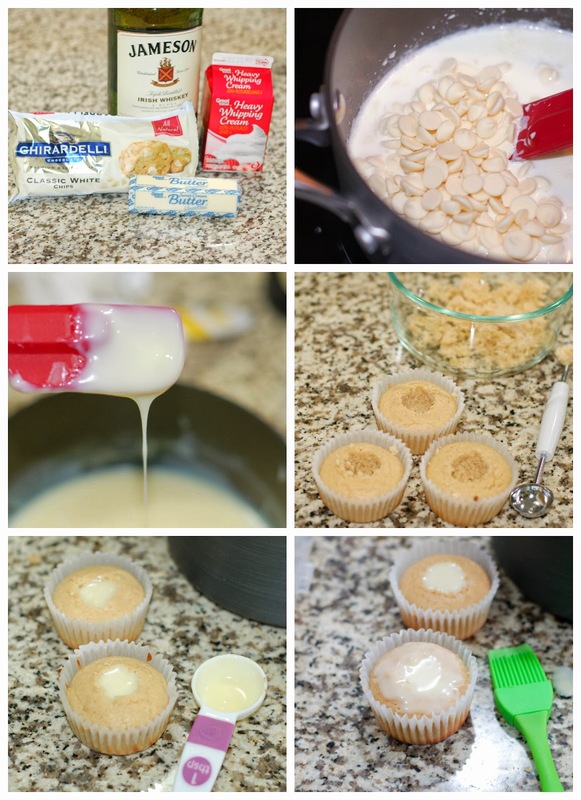 With a spatula or you favorite pastry bag and tip (I used Ateco #827) frost each cupcake. Cupcakes can be placed in fridge if you are not eating them right away, but they are best eaten at room temperature. Enjoy! These cupcakes look delicious! I love all the additions of different liquors, especially Baileys for me! Thanks Jessica. I love Baileys too. Can you substitute heavy cream for the shortening in the frosting? CAROLE! Oh my goodness, girl. 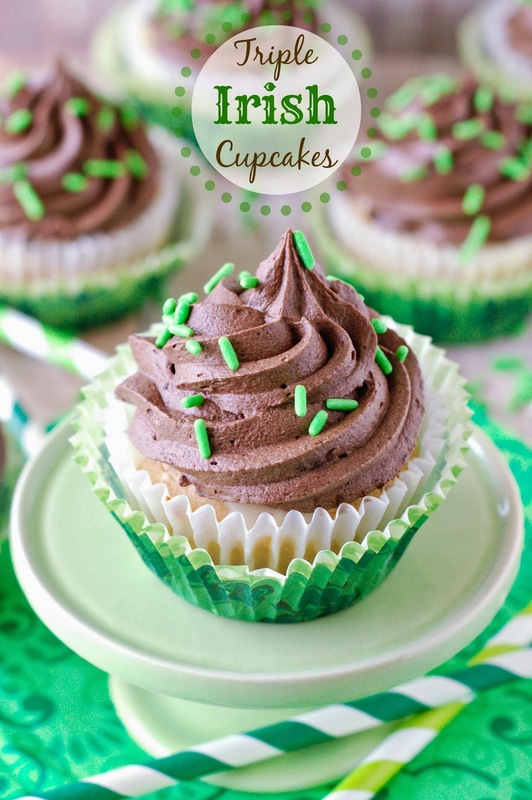 This recipe sounds oh-so-decadent and AMAZING for St. Patrick's Day... and I'm incredibly tempted to bake them before tomorrow's parade here in Dallas because I know they would be a hit! Also, I just wanted to let you know this was one of my favorite links from last week's That's Fresh Friday Link-Up, and I've included it in my post that went live today for my favorites. I hope you're having an amazing Friday, and happy baking! Thanks Erin. So glad you liked them! Thanks for stopping by Chrystal. I am not Irish, but I love the ingredients too!